MSU Football: Who Gets the Franchise Tag? If the world of college football was like the NFL and you could undoubtedly keep 1 guy on your team for next year who would it be? The franchise tag “is a designation a team may apply to a player scheduled to become an unrestricted free agent.” This move is usually made because the player is of high demand or he has the highest value to your team. This topic was discussed on Bulldawgs247 by Paul Jones. I thought it was an intriguing one that warrants some thought. What route do you take? Let’s take a look at some viable candidates for the franchise tag if you were the GM of MSU football. After the discussion I will tell you who my pick would be and it may surprise you. QB Tyler Russell- The senior put up some good numbers in ’12 (2,897 yards, 58.6 completion %, and 24 TD). A team’s success usually goes hand in hand with the success of your general. Tyler’s value to the team is immeasurable. During the 7-0 start, he was fantastic. 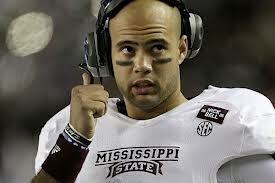 There is no doubt that if MSU is to take the next step to higher level bowls, Russell will have to get us there. He would be a serious contender for the franchise tag. RB LaDarius Perkins- The do-it-all animal for MSU. Perkins racked up 1,024 yards and 8 TD’s on the ground last year. He also piled on over 1,500 total yards. One of our most explosive guys returning on offense that can take it to the house at any time. Perkins is very valuable in the running, passing, and return games making him a very viable pick for the franchise tag. LB Benardrick Mckinney- The rising sophomore put his stamp on a stellar freshman year with 102 tackles and 4.5 TFL on his way to Freshman All-American honors. At 6’5 235 he is the centerpiece of MSU’s defense for the next 3 years. He’s got the NFL size and speed and is primed for another huge year with experience under his belt. The sky is the limit for McKinney. His ceiling is sky high and that alone makes him a major player in the franchise tag conversation. CB Justin Cox- Before anyone second guesses this one you have to think for 1 second. MSU is replacing 2 guys that will go in the top 3 rounds of the NFL draft in Jonathon Banks and Darius Slay. There is not a more important position of need than CB. Cox is a highly decorated Juco star that was the biggest get last recruiting cycle for next year. MSU fans are hoping his elite talent will transition the secondary seamlessly. His talent plus the need at corner make him a contender for the tag. OG Gabe Jackson- Rising senior Gabe Jackson passed over the NFL draft to return to MSU for his last season. The 6’4 320 lb mauler is rated as the 2nd best college guard for next year’s draft. Jackson is in a position where he could work himself into the 1rst round of the NFL draft next year. He’s the most talented guy on the team right now. Offensive line is crucial and your best guy up front is your bell cow. It would be hard to pass him up for the tag. OT Blaine Clausell- Junior to be Blaine Clausell plays the most important position on the field with a pro-style right-handed quarterback, left tackle. Clausell was forced into action as a freshman due to injuries and he took his lumps. 2012 we saw a much improved Clausell. At 6’7 305 and really good on his feet, Clausell has the tools to be a really good LT in the SEC and possibly the NFL if he can continue to improve the next 2 years he is on campus. A bookend LT is a prime candidate for a franchise tag. Now let’s get to the fun part, my pick. If I was the GM of MSU Football, I would put the franchise tag on Blaine Clausell. Let me explain. There are more talented guys on our team right now. There are guys primed for post season honors. There is not a single player on our team more crucial to next year’s success than Clausell. Tyler Rusell is a great QB but I have faith that Dak Prescott could step up if needed. Ladarius Perkins is a great player but I have full faith in Derrick Milton and Josh Robinson picking up the slack if they are called upon. As bad as we need Justin Cox to step up, he has to go out there and prove himself. Gabe Jackson is a mauler but we have other interior linemen that are serviceable. There is no one behind Blaine Clausell that I have faith to do the job that I think he will do next year. Many fans were tough on Blaine after his freshman year. Freshman LT’s usually don’t fair that well in the SEC. Last year we saw a big jump. I think we can expect another jump this year where he puts himself in the top half to top third of the SEC’s LT position. We all remember the year he was thrown into the fire and what injuries did to that position and to that season. That is why I say he is the most important players on our team right now and deserves the franchise tag. This entry was posted in Uncategorized and tagged Football, Hail State, MSU. Bookmark the permalink.